Deluxe Flexi Disc Collector’s Box in Stock with Free Flexi Offer! On June 1, Bludgeon Riffola/Mercury/UMe fires the first salvo in DEF LEPPARD‘s projected four-volume career-spanning box set series, when the appropriately dubbed “Volume One” appears in multidisc LP and CD collections. The collection arrives in time for this summer’s highly anticipated DEF LEPPARD co-headline tour with JOURNEY. To promote the arrival of “Volume One”, DEF LEPPARD has released the official lyric video for what is probably the band’s most recognizable song, “Pour Some Sugar On Me”. Check it out below. 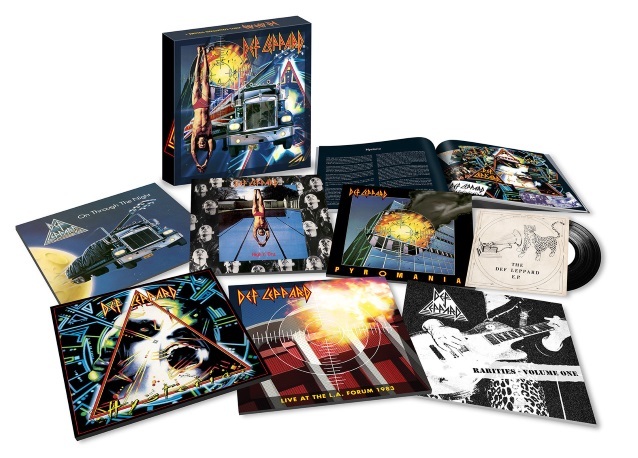 This first volume of the band’s complete recorded output comes in both limited-edition 180-gram heavyweight vinyl and CD box sets, each featuring DEF LEPPARD‘s first four studio albums — along with some choice bonus live and studio material — all spread across 8LPs and 7CDs, respectively. The “Volume One” collection includes bonus material, including “Live At The LA Forum 1983”, originally released as a bonus disc in the deluxe CD version of “Pyromania”, making this the first-ever vinyl offering of the complete show. This 2LP version comes with a new sleeve and inner bags. “Rarities Volume 1” has been specially compiled by Joe Elliott, containing rare B-sides and recordings from DEF LEPPARD‘s early years, all in a newly commissioned sleeve. Finally, rounding out this collection is the 7-inch vinyl single and 3-inch CD of DEF LEPPARD‘s original, self-titled EP. The fiery “Volume One” collection contains all of DEF LEPPARD‘s iconic 1980s recordings with reproductions of the original packaging in both formats, plus the added bonus of a replica 7-inch single and 3-inch CD of the band’s original independent EP, the self-titled “The Def Leppard E.P.”. Each album in the box set was mastered by longtime band producer/soundmaster Ronan McHugh and cut by Greg Moore. Housed in rigid boxes, the “Volume One” collection also contains a hardback book with rare photos by longstanding band confidant Ross Halfin and liner notes by Classic Rock‘s Paul Elliott. DEF LEPPARD bandmembers Joe Elliott, bassist Rick Savage, drummer Rick Allen, and guitarist Phil Collen have all also contributed their personal introductions to the collection. “Volume One” is an extraordinary early chronicle of a band whose global impact only continues to grow. DEF LEPPARD have a cumulative sales tally of over 100 million albums worldwide, not to mention putting on consistently sold-out world tours. DEF LEPPARD recently authorized their entire recorded catalog for access on streaming and download platforms, a move that resulted in a nearly 400 percent surge in catalog sales on the first day alone, as well as appearances in the iTunes Top 10 charts in over 30 countries worldwide. “Volume One” kicks off with DEF LEPPARD‘s 1980 debut album “On Through The Night”, which immediately put the rock world on notice that the band were destined for big things, having charted at No. 15 in the U.K. and No. 51 in the U.S. Produced by Tom Allom (JUDAS PRIEST, BLACK SABBATH), “On Through The Night” features many of the band’s live favorites (“Rock Brigade”, “Hello America”), along with updated versions of early singles (“Rocks Off”). The album achieved platinum status in 1989, and the version included here is the rare Australian gatefold-sleeve version. Released in 1981, “High ‘N’ Dry” was DEF LEPPARD‘s second platinum album and the first to be produced by Robert “Mutt” Lange (AC/DC, FOREIGNER). It reached No. 26 in the U.K. and No. 38 in the U.S., having garnered much impactful FM airplay with the propulsive “Let It Go” and one of the band’s most popular signature tunes to this day, “Bringin’ On The Heartbreak”. “Pyromania”, released in 1983, saw the band become indisputable rock legends. It was the first record to feature guitars by Phil Collen, who had replaced Pete Willis. The album contains massive MTV hits “Photograph” and “Rock Of Ages”, as well as fist-pumper “Rock! Rock! (Till You Drop)”. “Pyromania” reached No. 2 in the U.S. and went diamond, with over 10 million album sales. Produced by Mutt Lange, “Hysteria” took over three years to make, ultimately featuring seven charting singles (including No. 1 smash “Love Bites” and “Pour Some Sugar On Me”), and has been rightly nicknamed as “heavy metal’s ‘Thriller’.” Clocking in at just over 62 minutes, “Hysteria” was then one of the longest albums ever issued on a single vinyl record — but for this special box set release, it has been made into a double LP for maximum sound-quality purposes. For the full track listing, click here.